Welcome to my NBA DFS matchups breakdown! 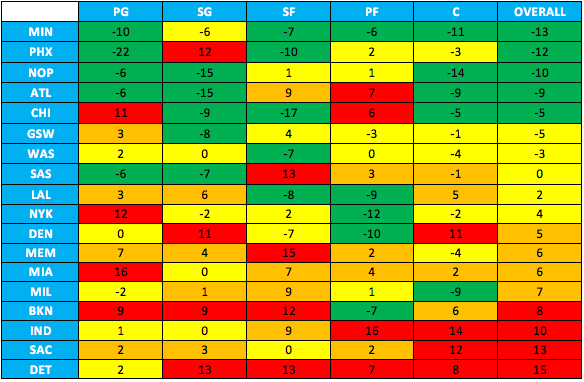 Here I use trend analysis from all the teams in the league and reflect upon how each position matches up to them. I will take each game on the slate and use the FantasyLabs trend tools to see the average amount of points given to each position by individual situation. I'll then take all that neat information and apply it to the current slate, giving us a look at how teams have historically fared in the circumstance, as well as a baseline for how we can project the current players filling those roles. I'll then break things down, give my thoughts on the slate and the players involved, and come up with my favorite plays with games to attack using the data available. It all gets pretty awesome, I hope you enjoy! Without further ramblings, let's look at things, shall we? Point Guard has a lot of guys that appear mispriced for this slate, including Eric Bledsoe ($7200), Reggie Jackson ($4900), Matthew Dellavedova ($3800). All three have good reasons for being so cheap, but that doesn't mean that we may be able to exploit the cheaper price tag at lower ownership. Jerian Grant has the best matchup for the position today at Phoenix (9.1 over expectation, 88% Consistency) followed closely by Derrick Rose (8.8, 75%). Goran Dragic has torn Brooklyn apart each of the times he has faced them in the last month (41 and 45 Fantasy Points) and there's no reason to believe he doesn't do that again. Ricky Rubio is going to be in my favorite game of the slate (more on that later) and Jrue Holiday has been out of his mind lately. Rounded out the list is Stephen Curry, but his matchup (-.9, 45%) isn't anything that should push you away from rostering him if that's your cup of tea. This position has some good options, and ownership will likely be spread out nicely. Shooting Guard is actually kind of stacked today! with plenty of nice mid-range sharpshooters available to pick through in good matchups, this might be a spot that we put a little thought into instead of just punting it like usual. 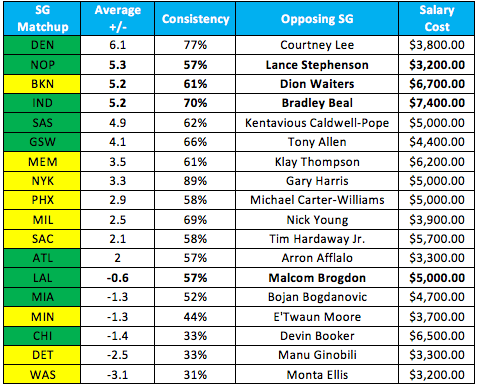 I prefer to focus on consistency here, and Gary Harris draws the most profitable spot (3.3, 89% at the Knicks) followed by the SG on the other side, Courtney Lee (6.1, 77%). Bradley Beal has been lighting up the scoreboard lately (averaging over 25 in his last 5) and has a fantastic matchup with Indiana (5.2, 70%), and if Dion Waiters plays he will get to tee off on the Nets defense. We get a couple interesting spots with Chicago (Wade may rest) and the Bucks (Who starts for Jabari?) and I believe Michael Carter-Williams and Malcom Brogdon may get extended minutes with backcourt space available. 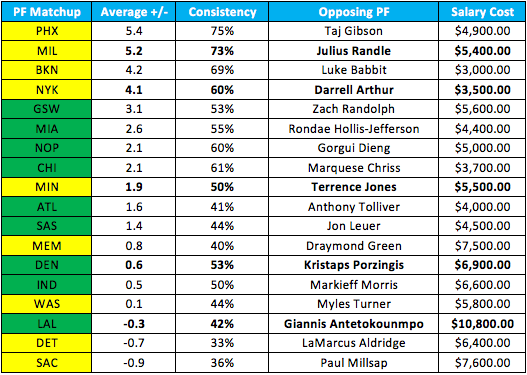 Manu Ginobili and Monta Ellis have the worst matchups on the board (-2.5 and -3.1, respectively) and should be avoided as there are better punts to turn towards. This is a good position today with plenty of flexibility. 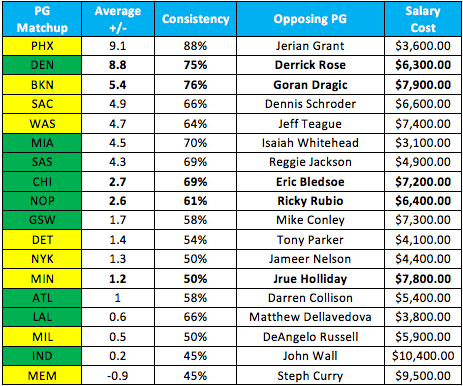 Small Forward has a whole bunch of overpriced backups and the studs stuck in less than great matchups. I won't pay $5600 for Matt Barnes because he's not really that great at hoopball and DeMarcus Cousins will be back to soak up the extra usage, and Wilson Chandler at $7100 now must hit 35 fantasy points to pay off his price, which is getting a bit too much for his realistic expectation. Andrew Wiggins is still underpriced for his usage without Zach LaVine and has a decent spot at home against the pelicans (1, 60%), and Jimmy Butler will be back from his heel “injury” at $9000 on the road in a pace up game against the suns. The best matchup, and my favorite play by far, is Brandon Ingram at Milwaukee (7 points over expectation, 85% consistency) and honestly, I don't think I want to go anywhere else. Just lock in Ingram and move on. Khris Middleton is interesting back from injury, but I want more than 20 minutes and I'm not sure they give him that much leash. Overall, just play Ingram today. Power Forward is my least favorite position today, as we have a lot of question marks and unknowns to go with the options. 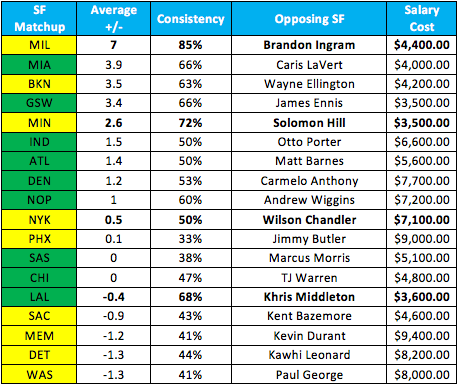 The list tops out with Taj Gibson at Phoenix (5.4, 75%) and Julius Randle (5.2, 73%), and with Randle back up to a full allotment of minutes (30 last game) he is fairly underpriced in a good spot. Darrell Arthur should step into the starting lineup if Kenneth Faried is unable to suit up and should crush value at only $3500. Zach Randolph is still questionable, but has a decent matchup against the warriors as Draymond Green follows Marc Gasol around. Terrence Jones (another piece of the NOP@MIN game) at $5500 is pretty expensive but should be the odd man out on the court and has a plus matchup (1.9, 50%) to feast on. I'm interested to see how Kidd handles the rotation with Parker out for the season, but I would think they slide Giannis Antetokounmpo to the 4, but who knows. Jason Kidd does whatever he wants and it's impossible to know for sure! Paul Millsap and LaMarcus Aldridge are the bottom men on the matchups totem pole, but neither has a terrifying opponent. PF has plenty of options worth considering in all price-ranges. Center has some really exploitable matchups today that I think people will miss because of one reason or another. Marcin Gortat is the truth in cash games, as he has met or exceeded his expectation in nine of his last ten, and now draws a home game against the Pacers (10.1 over expectation and 100% consistency). 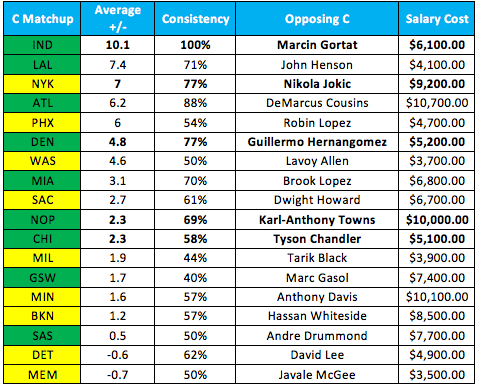 Nikola Jokic (7, 77% at NYK) continues to be the best player in the history of basketball but is finally priced where he should be, eliminating a lot of the value we get from his reduced ownership. DeMarcus Cousins (6.2, 88%) coming off suspension against Dwight Howard will basically come down to who gets ejected first (Both are hot headed, I'm avoiding) is a killer GPP play, and Willy Hernangomez (4.8, 77% at home against Denver) continues to gain popularity and is still easily exceeding his price tag coming off the bench. Tyson Chandler (2.3, 58%) should easily win the battle on the boards against Robin Lopez and projects well towards 15 rebounds. My favorite option in GPPs in Karl-Anthony Towns as part of a game stack against the pelicans, but we can get into that later. There are a lot of really good plays at this position, meaning that Utility spot is going to come in handy. 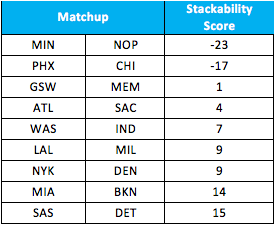 There are two very obvious games to look to for stacking today with the Pelicans visiting the Timberwolves (score of -27) and Chicago playing the Suns (-17). The Wolves have a difference of at least 6 places in each position defensive efficiency in the last ten games in comparison to their January scores, and the Pelicans aren't much better. We get the extra usage without Zach LaVine that still hasn't been accounted for in price (Wiggins/KAT) and the Pelicans look fantastic on offense lately with both Jrue Holiday and Terrence Jones flashing some upside in recent matches. With the Bulls in Phoenix we may get all the value we need to fit the studs. I'm thinking that Dwyane Wade is going to sit, giving us interesting options if Paul Zipser can play (ankle issue) or if Michael Carter-Williams continues to start next to Jerian Grant (which is what I would think they do). Phoenix plays fast and loose, and the Bulls will be playing up in pace with Jimmy Butler back from injury, keeping things close. I would probably look to go 2/2 with this game and find another game to mini stack, but we definitely want to find a way to get some exposure here. I did want to point out how great the Pistons have been defensively, and that Brooklyn might not be a spot that we instantly attack every time they play. Both teams have really stepped it up defensively as of late, and knowing that will keep us away from inflated ownership. I could list about a hundred reasons why you should take Derrick Rose tonight, but I don't think I'll need to, because you were probably already considering going there! Denver is 30th in defensive efficiency in the last ten games and has been 30th since the beginning of January, they are just the stone worst against opposing Points. They are giving up 8.8 points over expectation to the position over the last month, and Derrick Rose has flashed 45+ point upside in the right matchup this year. I know he fragile, and he has actually burned me in this spot before, but I'm not going to pass him up tonight. Dennis Schroder just tore up this defense for over 40 FPS, and we can project Rose for just about that with plenty of room for upside. Roll him out with confidence and get your pivots elsewhere. Hot take time! I think Lance Stephenson puts up 25+ fantasy points tonight, with the possibility to hit 10x value. Lance steps into a situation with a star player out for the count, and he has already been heavily utilized in the gap. In his first game with the Wolves, he played as many minutes at SG as the starter (Brandon Rush) as well as minutes at SF and PF. As mentioned above, I love the idea of stacking the Pelicans/Wolves game and Stephenson is a cheap contrarian way to get exposure. If we assume that Stephenson will play his majority minutes at the two, he draws a matchup giving up 5.3 points over expectation against New Orleans who is 27th in DE against the SG position. If you want a low owned party punt, look no further. Since entering the starting lineup over Luol Deng a couple games ago, Brandon Ingram has really been showing what he can do. He has taken double digit shots in those games, averaging a statline of 14/5/3 at 29 minutes a game. Today, Ingram gets a nuts matchup with the Bucks who are giving up seven points over expectation at an 85% clip over the last month (which is beautiful), and just lost Parker meaning that their frontcourt should be in absolute disarray. With SF, you are either paying for Durant and Punting, and Ingram is still cheap enough that you won't have to sacrifice salary to have a solid option. He is averaging a little over 23 fantasy points per game when starting, and should project well over 25 and pay off value easily. I really don't like PF much today, but I do like Kristaps quite a bit. PorzinGOD is back from an Achilles injury that forced him to miss several games earlier in the year, and is looking back to full form. He put up 27 real life points against the Clippers 2 days ago, on over 50% shooting (with 4-7 from the arc) and put up 19 shots, which is key. I was hoping he would get a bit of a price drop because of Denver's above average PF defense (11th in DE last 10), but I'll take what I can get of a $7700-$8000 stud at a decent discount. The Knicks will be playing up in pace and so long as Porzingis puts up 15+ shots I have no worries about him beating Darrell Arthur and meeting value. I'm projecting 38 fantasy points for the Unicorn. KAT has been in incredible form lately, averaging 53 points over his last 5, and not having a real down game since playing the Mavericks on January 15th (36 FPS). His price is up high enough that people would rather pay for Anthony Davis or DeMarcus Cousins, meaning we should get him at less ownership than other slates. The best part? The Pelicans have experienced a drastic drop in Defensive Efficiency against Centers down 14 points over the last 10 games, and currently sitting at 25th. KAT is better at home than on the road, and Anthony Davis is worse on the road as well. You would have to look pretty hard for find a bad piece of this matchup (it's pace down for the Wolves? Whatever man), and I'll be getting as much Towns as I can fit. Special mention: Marcin Gortat has a matchup that hasn't failed since the middle of December, and has put up over 5x almost 10 games straight. Use Gortat in cash, but KAT is the GPP winner tonight! We have plenty of games that are worth stacking and attacking, but this slate really seems like more of a cash game/optimal build kind of night. I just don't really think I want to spread out exposure too much since I like so many plays so much, it's just easier to build around a core of 5 or 6. However, that doesn't mean we don't have a lot to like in boom or bust plays with Derrick Rose and Lance Stephenson (among others). We should see a median cash line in the 270-280 range (if exposure is spread like I think it will be) with less game stacks. Building a balanced lineup seems to be the way I would go. Good luck and may variance be on your side! As always, you can find me on Twitter and shoot me any questions you have! I'll do my best to help all the way to lock! Good luck, and I hope you find the green! 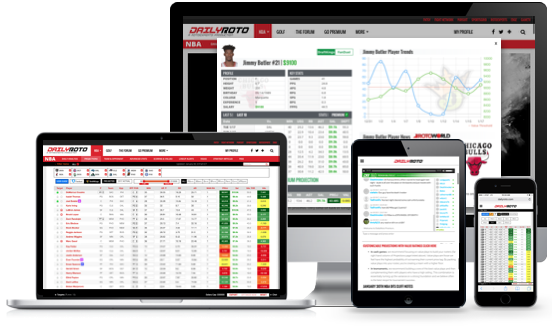 Professional Commentary via Premium Podcast and Written Analysis, Lineup Construction Advice, Customizable Daily Projections with Site Specific Value Rankings, Top Value Players, DFS Strategy Guides, Lineup Alerts, Premium Tools Access, Live Premium Subscriber Chat and more!